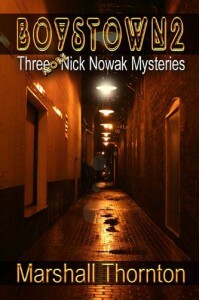 Awesome sequel to [b:Boystown: Three Nick Nowak Mysteries|7386067|Boystown Three Nick Nowak Mysteries|Marshall Thornton|https://d.gr-assets.com/books/1261536657s/7386067.jpg|9243139]. The mystery is more dark and somber and the three installments are nicely intertwined. Nick is becoming a more introspective character although his dry humor made me smirk a lot. Glimpses’ of Nick’s ex-boyfriend Daniel contribute to a romance aspect which I was not expecting.